The Podolica breed is a descendent of the bos Primigenius Podolicus, very large-sized long-horned cattle thought to have been domesticated in the Middle East during the fourth century BC. There are two theories about the origin of Podolica cattle. According to one, the Podolica derived from cattle that came to Italy in 452 BC following the Huns who, along their way from Mongolia, passed through the Ukrainian steppe, which can be considered the true birthplace of the Podolica breed. Instead, another theory states that as far back as the first century BC, there existed long-horned cattle from Crete, an area that, even in the Minoan age, had macroceros cattle which can be identified as bos primigenius. 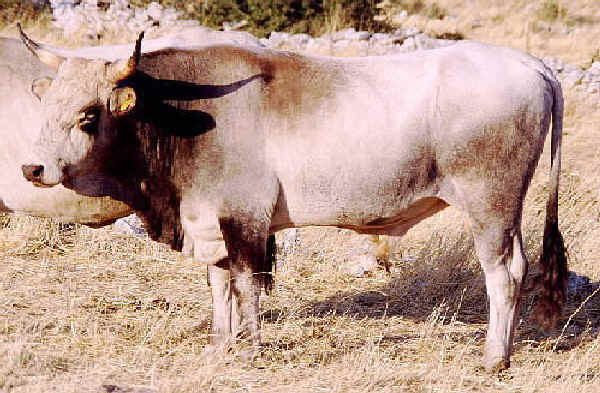 The Podolica breed has spread throughout an area that mainly covers the inland territories of southern peninsular Italy (Abruzzo, Basilicata, Calabria, Campania, Molise and Apulia). 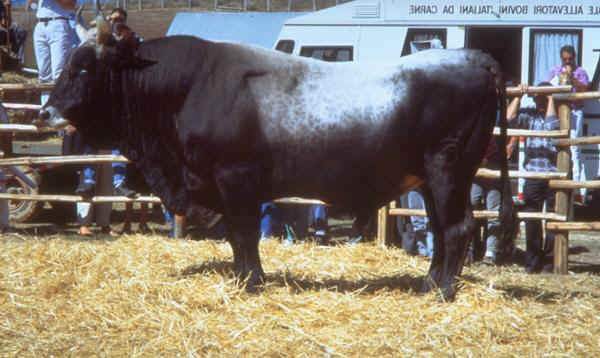 The breed numbers 100,000 head, 25,000 of which are listed in the Italian Herd Book of ANABIC, the association responsible for the development and selection of this breed. One of the outstanding characteristics of this cattle is its exceptional ability to adapt to particularly difficult environments, as well as its extraordinary capacity to utilize food resources that would not otherwise be used. In fact, this cattle is able to make the most of shrub-covered grazing areas as well as stubble and bush areas, using the leaves of shrubby elements, tree shoots and grassy underbrush. There are currently 21.000 head of cattle. It has been present in Italy for a very long time and represents yet another example of successful biological adaptation to hostile environment. The breed is widespread over a rather vast area that includes all of southern Italy.As a result, this has caused a great deal of variability in its size adn in the color of its coat, which can range from white to dark gray. Pigmentation is black. The podolica has a lightweight skeletal structure with slender legs, excellent perpendicularity and strong feet. Adult buls weigh from 600 to 800 kg. The Podolica was long used mainly in a work capacity and only secondarily for beef and dairy products. In fact, its milk is ideal for producing the famous "caciocavallo' cheese. Subsequently, with the rise and spread of agricultural mechanization, the selective trend of this breed became geared more towards beef production and, to a lesser extent, towards dairy production, particularly in certain areas. As far as the reproductive aspect is concerned, age at first calving is rather advanced (about 3 years). This is due primarily to the breed's harsh habitat, which can be noted above all during the heat of the summer months, which significantly decreases the amount of food resources available and thus slows down the growth of younger animals. 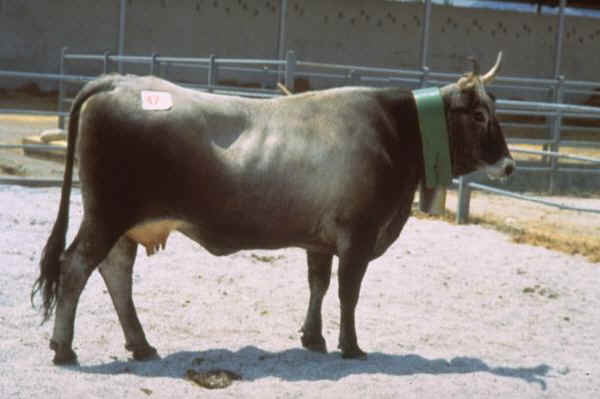 Nevertheless, this type of cattle develops a long reproductive career, breeding for over ten years with an average time span of fifteen months between calvings. For the most part, calvings are spontaneous and are concentrated during the springtime. Calves are suckled for at least four months. The calves are then weaned in order to be sold for slaughter at around 15-16 months, with weights ranging around 300-350 kg. In some cases, as far as males are concerned, heavier bullocks are produced and these subjects are slaughtered at around two years of age, at a weight of 500 kg. A robust and frugal breed comparable to the Maremmana, it is capabel of expoliting grazing areas coverd with shrubs, stubbles and thickets. It is characterized by its docile nature, otustanding maternal capability and long reproductive carreer. Calves are born spontaneously and weigh an average of 30 kg ata birth. Cows reach a weight of 400-500 kg by adulthood and produce plenty of milk rich in fat, which in some areas is used to make higly prized soft cheese.